Never get lost in woods! Ideal for measure direction, longitude and latitude, horizontal and so on. Compact size and solid built, easy to handle and carry. Foldable metal lid. Floating compass dial with 360 degree scale. Luminous magnet arrow. Adjustable prism lens. The luminous effect refers to the phosphor power under the light, can be seen after uv light irradiation. The more light irradiation, the more durable lumious indication. 1.Durable & Compact, Durable metal construction. High accuracy. Waterproof Feature, Works well in all weather conditions. 2.Built in Adjustable luminous marching line, Thumb hold and magnifying viewer, Sighting hairline, Floating luminous dial, and Liquid filled for fast readability! 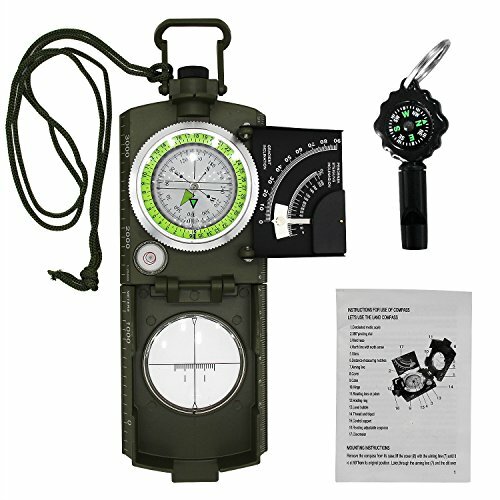 3.Multifunctions: Foldable metal lid, Floating compass dial with 360° scale, Adjustable prism lens, Waterproof Shakeproof. 4.Ideal For camping, hiking, adventure, positioning, mapping, etc. What you get: 1 x Compass,1 x Whistle with Compass,1 x English Manual,1 x pouch. If you have any questions about this product by VOVCIG, contact us by completing and submitting the form below. If you are looking for a specif part number, please include it with your message.